One of My Hobbies | God is in the details! « I’m Climbing Out of a Kaleidoscope! 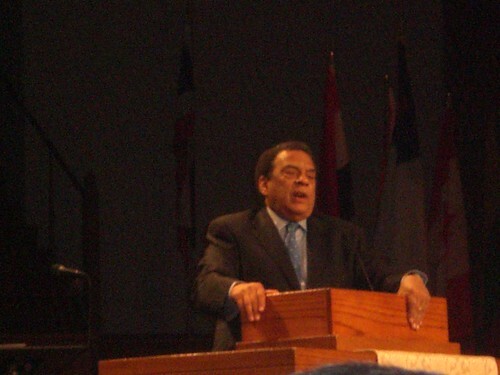 Andrew Young, former aide to Martin Luther King, former ambassador to the UN during Pres. Jimmy Carter’s administration, former Mayor of Atlanta who brought the Olympics here in 1996 was also the guest speaker at the opening service of the Global Impact Celebration at Roswell United Methodist Church. I was impressed by his genuine relationship with the Lord. He is also living history and I could have listened to him all night. 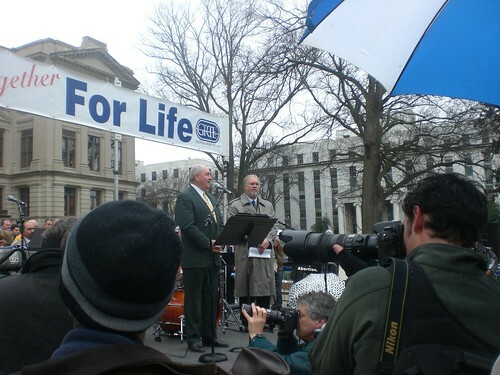 Many of his stories centered in on the influence missionaries have had on the lives of current world leaders. He told story after story of missionaries who would sacrifice to send gifted and bright local children to schools in the United States for opportunities they could never hope to obtain in their own 3rd world countries. Many of the leaders of which he spoke are now at the head of countries who are enemies or at least very cool in their relationships with the U.S. However, many of them speak warmly of the people of our country because of the love and nurture Christian missionaries showed to them. Very interesting, I think, to hear of the great influence missionaries around the world have in shaping future leaders in remote places. 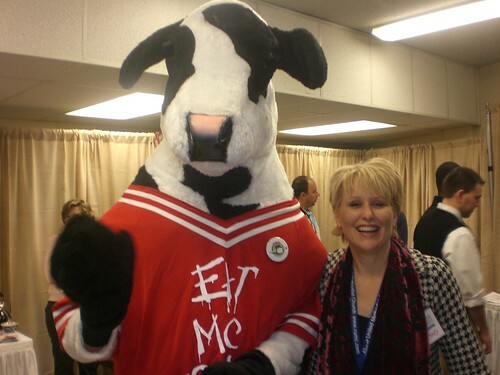 Here I am with the Chick-Fil-A cow! 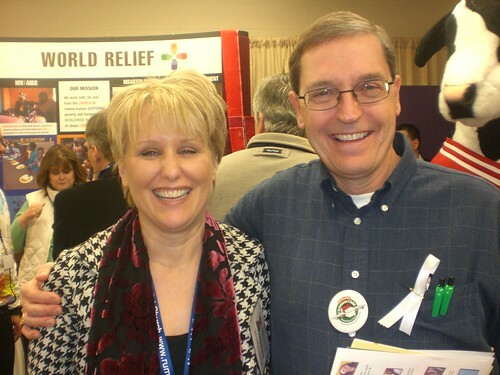 And five minutes later, I got my picture taken with another notable person: Pastor Mike Long of RUMC. He is very kind and warm. Why do I always have such a weird look on my face when I smile really big? Oh well. On our way to the Montgomery Puppet Festival, we drove right alongside John McCain’s bus and satellite truck. I don’t know if he was in the bus at that moment or not. However, he had been all over the local news that day because he was campaigning throughout Georgia. I think he was probably in the back taking a nap! They may not be famous to anyone else, but the New, Gold-medal winning M&M Puppeteers sure were famous at the Puppet Festival! 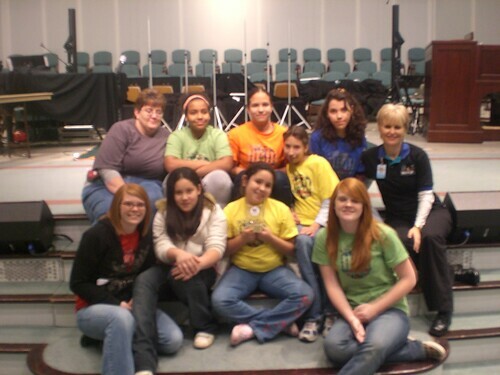 Here we are with our trophy. 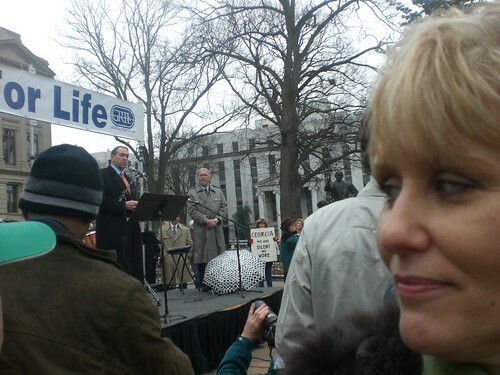 Boy, you sure hobnob with the bigwigs, don’t you? I am so proud of the puppet team! Yea! That is a lot of famous people in a short amount of time. 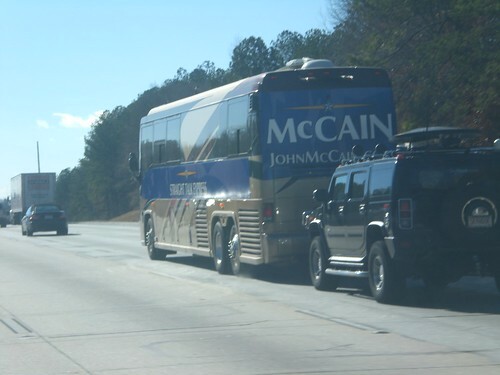 John McCain’s bus, that is pretty neat, I have never seen one of those. Those M&M’s they are pretty famous aren’t they! I am truly impressed with the picture of the Chik-Fil-A cow. Surely your greatest moment ever.